I came across an interesting stat looking at some numbers that I wanted to share. Hoping to see other areas as I'm very curious now. Looks like when October was below normal, December ended up above normal 77% of the time. And The 9 times since 1990 that October ended up warmer than normal, December ended up below normal 6 times. For Memphis International. Data before 2000 is kind of estimated by me because I had to get it from Wunderground. Cool thanks! I was going to say thats interesting December doesnt show up below normal but I see some missing years. For IND. Choose the months then click next. Here's the F6 but only goes back to 1996. But at least you feel confident its official and fill in missing years you have. Then use link above for previous years. Chicago's autumn temperatures offer a clue about the coming winter's readings only when substantially warmer or colder than average. Fall temperatures less than 2.5 (degrees) from historic averages yield no statistically significant correlation with the winter temperatures which follow--winters turn out warmer and colder than average with about equal frequency after such falls. This autumn falls into that category. To date, Chicago temperatures since Sept. 1, despite recent record-breaking warm spells, are just a degree above normal. These conclusions derive from a detailed computer analysis of Chicago weather records back to 1872 by my colleague, meteorologist Richard Koeneman. He's found that winters that follow September through November periods more than 2.5 (degrees) above or below historic norms do serve as indicators of the coming winter. Winters that follow such falls tend to reverse the autumn temperature trend--i.e. very warm autumns lead to cold winters while chilly falls are followed by mild winters. Though La Nina's global effects are generally considered less pervasive than El Ninos, in-house analyses have linked a slight tendency toward wetter than normal springs with the event. Stronger La Ninas have impacted summer weather here. In eight of nine warm seasons since 1950 identified as having coincided with La Ninas comparable to the one predicted this summer, Chicago temps have averaged warmer than normal overall from June through August. These years have produced an average of 33 days of 90s at Midway Airport, more than the average of 24 since 1928. 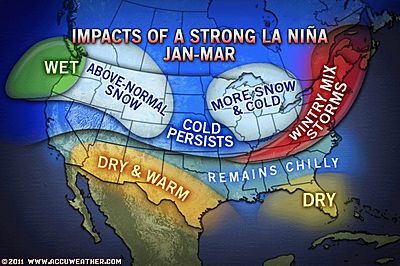 El Niño" is not a meteorological event, but its occurrence has huge effects on the world's, and Chicago's, weather. El Niño is an abnormal warming (by a few degrees) of water in the equatorial belt of the Pacific Ocean westward from South America. 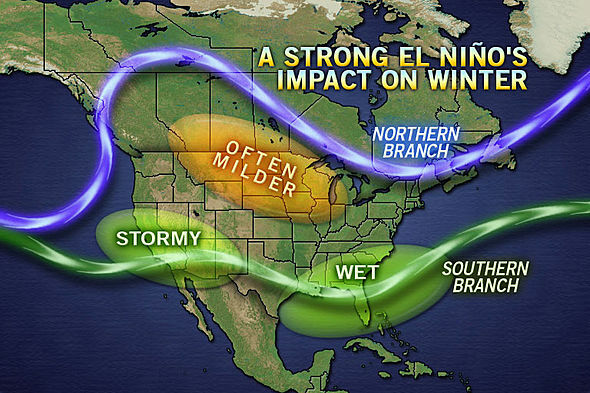 El Niños, when they occur, usually last up to about 18 months. They have little impact on U.S. temperature and rainfall patterns during the summer and early autumn, though they can help to suppress Atlantic Ocean hurricane activity. Late autumn and winter is another story. 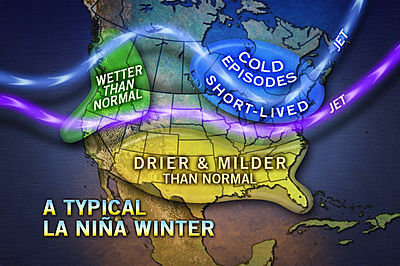 At Chicago, "El Nino winters" are usually milder and less snowy than normal, sometimes dramatically so if the El Niño event is especially strong. 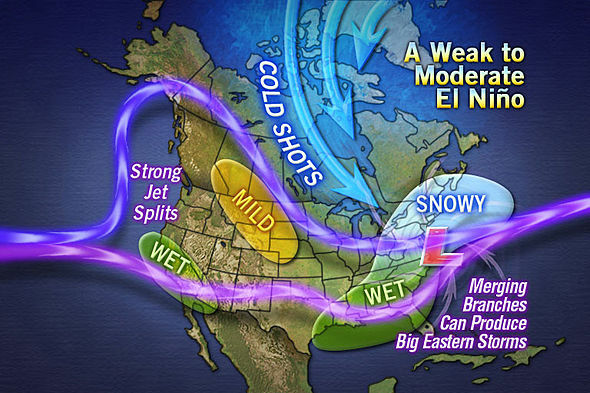 For now, an El Niño is not expected. I don't think there's any connection between autumn and the next winter's temperature here. So what was the past 5 years? But we're going off topic now. Here's Syracuse NY below normal Octobers since 1990. 9 times and only 3 times January ended up above normal. What are the effects of a CP or "Modoki" El Nino? Do you have a map showing that? There was an El Nino in 2009-2010 that should have given us a milder drier winter, but it was overrun by a consistently negative Arctic Oscillation. 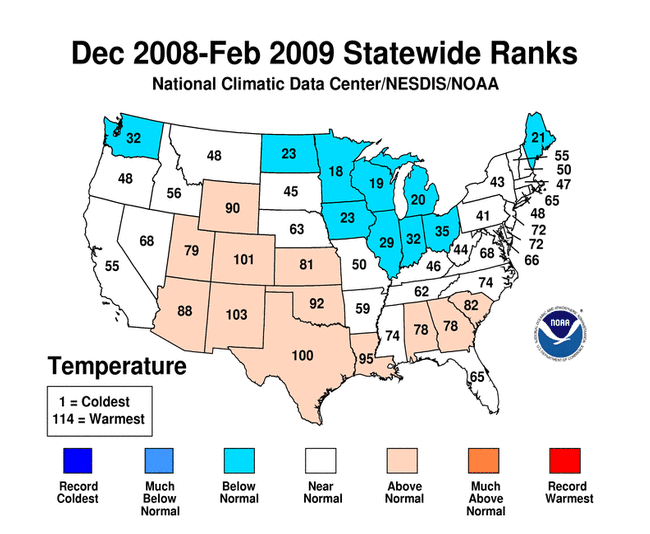 2008-2009 was a second La Nina year which that January saw extremely cold temps here, and overall a colder then normal winter. Lots of snow too.